Our humane cat traps are just the trick for catching your cat that won’t come home or catching the local stray cat who’s been injured. 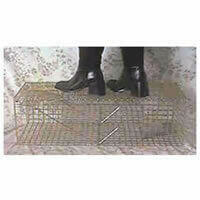 These cat traps just catch the cat without harming him/her. nnThese traps are especially great for catching feral cats that need to be brought to the vet for neutering to stop your area being overrun with wild cats.nnQuickest way to get the cat into the trap? Now make sure they’re not listening.. Buy a tin of tuna (it’s very cheap and has the best smelling effect for cats) and complete a trail a couple of feet back from the trap into the trap. Make sure you don’t put out too much tuna as the cat will eat it all and stop being hungry before it gets to where it’s meant to.